Currently, the farm offers opportunities for students/partners to live sustainably and to learn about growing food organically in tropical conditions and to experience a way of life vastly different from that of urban North America and Europe. In addition to growing food for our own needs, we produce organic Blue Morpho Chocolate and Coffee, medicinal herbs and plants, teas, dried fruit and power bars. 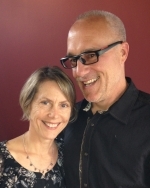 Gretchen and Rob Mokry are the proprietors of the farm sharing time between Costa Rica and San Francisco, CA. 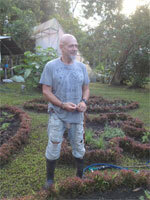 Both have permaculture design certificates and organic farming experience. Gretchen is a certified yoga instructor, certified Permaculture Design Certificate instructor, accomplished dancer and painter, and a licensed Architect specializing in sustainable design and construction methods. She has designed and built schools and community buildings in various relief areas such as Haiti, Africa and Latin America and has an Architecture practice in San Francisco CA. Rob grew up in Central Ohio and worked on various family farms. In 1993 he moved to San Francisco CA where he has maintained an organic urban farm with Rouen ducks. He is a general contractor and specializes in sustainable construction and renewable energy. He has supervised construction of utility scale ground mount solar farms in Germany, Italy and the United States as well as distributed generation rooftop installations. He is an accomplished fabricator in various mediums and enjoys playing acoustic music, the culinary arts, mycology and animals. Walter grew up on the family’s organic farm in Germany during the 1960s and 70s. After more than 30 years in the business world he has returned to his roots and he manages the day-to-day operations at Finca la Puebla. Walter has been doing some construction, working in the gardens and is now directs and manages the Permaculture and Organic Farming program. Walter is also growing microbial soil inoculants from fungi collected in forested areas of the farm. These microbes occur naturally in the forested areas but are often depleted in garden and plantation environments. We are reintroducing them into the gardens and seeing significant improvements in growth. We offer extensive Permaculture Design Certificate (PDC) courses – Please inquire for upcoming dates. We have increased space for students and can now accommodate eight people in very comfortable coed bedrooms. We also have a private master bedroom for couples. The creek cabin is now available for private couple housing and is known as the Jungle House. We have a larger area of the farm in gardens to accommodate the greater number of partners. The drying shed has been enlarged to accommodate our excess bananas, fruit, chocolate and coffee. We continue to diversify the old coffee plantation with plantings of banana, chocolate and black pepper as well as mixed fruit and wood trees throughout this three-acre section of the farm. Finca La Puebla is located in southern Costa Rica about 5 miles from San Isidro de El General at an elevation of about 2700 ft. Pacific beaches are 20 miles to the southwest and Cerro Chirripo, the highest peak in the Talamanca mountain range 10 miles northeast. The climate is warm and humid without the stifling heat of the coast or the damp chill of the mountains. There are two seasons in this part of Costa Rica. Dry Season (December to mid April) with very little rain and Rainy Season (Mid-April – Nov) with rain in the afternoon and sun most mornings. Temperatures year around are generally between 65 degrees F at night and 85 degrees F during the heat of the day. The farm has dramatically changed over the past decade and a half. The coffee is growing in the shade of fruit, nut, wood and nitrogen fixing trees and is inter-planted with chocolate, black pepper and root crops. 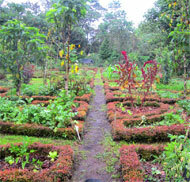 There is a large garden with a wide variety of fruit, vegetables, herbs and spices growing all year long. The more tender greens are growing under plastic cover for protection from heavy rains. There is a processing area and solar drying shed for the coffee, chocolate, bananas and fruit bars. The areas along the river and in the hills behind have been left to regenerate naturally and a large area in the central part of the farm is forested with native shrubs and trees and slow growing hardwoods. The areas around the house and cabins are more carefully landscaped with grassy areas punctuated with ornamental shrubs and fruit trees. We also have a small rock lined, spring fed swimming pool – wonderful for cooling off after a morning’s work. Trails wind throughout the farm providing easy access and additional opportunities to enjoy the beauty of the natural flora and fauna. The last 20 years of organic farming practices and a chemical free environment have allowed the lovely Blue Morpho butterfly to flourish at our farm. We have regenerated the jungle canopy and allow some fruit to fall to the floor of the jungle to provide food stock for these lovely creatures. They seem a positive barometer of our practices.